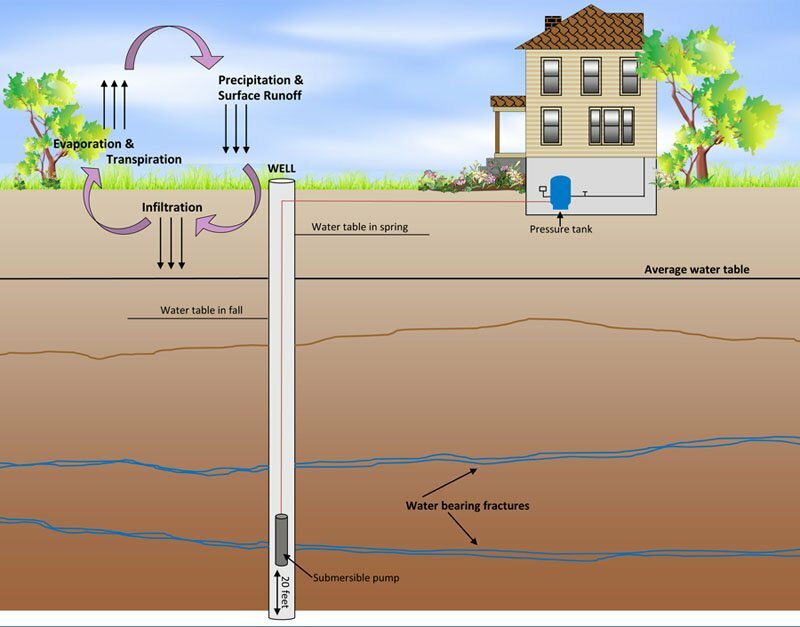 The hydrologic cycle (also known as water cycle) shows the process in which wells receive water. Due to the type of bedrock found in mid-coast Maine, we often find problems with iron, hardness, manganese, and acidic water. Radon and arsenic are quite prevalent in Maine, also. The first step to water treatment is finding out what exactly is in your well water. To do this you should have it tested through a state certified lab because issues such as bacteria, lead, arsenic, radon, and uranium can only be detected through testing. We offer free onsite evaluations. During an evaluation, we will look at your water quality issues, test onsite for ferric and ferrous iron, manganese, pH, and hardness, check the smell and clarity of your water, look at the plumbing and space where a system may need to be installed, and if you would like us to take a sample to a state certified lab for other testing, we will do this also (lab fees are not included in free evaluation). After an onsite appointment and evaluating any other lab testing available to us, we will provide you with an estimate for the type of system recommended to resolve your issues. The second step to water treatment is installing the appropriate system. As water treatment experts, we install and maintain systems that remove iron, manganese, hard water, acidic water, bacteria and e-coli, sulfur, lead, uranium, radon and arsenic. We install system to treat less common issues, also. The third step to water treatment is maintaining the system. A major consideration when purchasing a water treatment system is ensuring it will be properly cared for after installation. We believe it is important to establish a relationship with the customer and pride ourselves on the service we provide. If at any point after we have installed a water treatment system for you, do not hesitate to contact us if you have concerns. Typically, we like to do an annual renewal visit where we look over your system and do onsite testing. For certain customers, we may recommend testing your water through a state certified lab every couple of years. This ensures your system is always working properly.